SOMEWHERE TO GO. SOMETHING TO DO. SOMEONE TO TALK TO. Can you feel it? The Jackson 4 Visit The Way Youth Zone! MOTOWN legends The Jacksons left star-struck youngsters speechless during a show-stopping visit. Hysteria swept across The Way Youth Zone when the superstars strolled into the Wolverhampton hub with their families in tow. Crowds of delighted youngsters were left in awe of the icons, swarming the quartet for selfies and autographs yesterday. The brothers – Tito, Jackie, Jermaine and Marlon – were treated to a special tour of the venue, which supports young people in the heart of the city. a medley of songs performed by the Jackson brothers – including his tune ‘Get It Baby’. He added: “It’s been exciting, my first time in The Way, and I’m very excited to see the children and see how busy they keep themselves occupied in such a positive way. “It’s just a great place for kids to come hang out and just have fun, it’s beautiful. 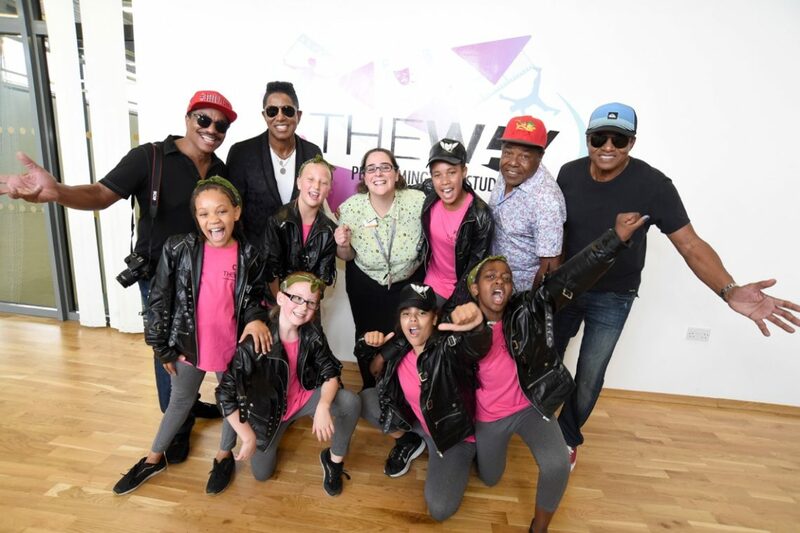 The legends – formerly of Jackson 5 with superstar brother Michael Jackson – enjoyed a tour of the School Street youth zone, including its dance studio, recording studio and holiday club activities. A special thank you to The Way’s Founder Patron Roy Bernard, who initially set up the visit! *Article is courtesy of The Express and Star. The Way Youth Zone will be hosting their second U18’s Night on Friday 12th April 2019 with Dj Springa and Dj Simmz from 6pm -10pm. This event is strictly for 13-17 year olds. Jamie and Jimmy cook up a storm for The Way Youth Zone on Channel 4’s Friday Night Feast! The Way Youth Zone’s Mentoring Programme has won an International Award! The Way Youth Zone in Wolverhampton is a purpose-built facility for the city’s young people aged 8–19 (and up to 25 for those with disabilities). We’re on School Street and we’re awesome. Please keep me updated on The Way Youth Zone news and updates by email, post, SMS, phone or other electronic means. The Way Youth Zone will always treat your personal details with the utmost care and will never sell them to other companies for marketing purposes. Registered Charity Number 1151247. Website by ATTAIN. Hey I’m Zen and i work as a Mentoring Youth Worker. My role on the programme is to support mentees and mentors alike, to get the best experience from the programme. Along with my love for my degree in psychology, I enjoy going comic cons and making costumes. It brings me joy to work for a programme that offers so much support to people (young and old) on all their journeys in gaining confidence and creating great connections. Hiya, I’m Sara, I support the team from an administrative capacity. My main hobbies are wildlife photography and going to rock concerts. I am so proud to be part of the mentoring programme because i feel that having a mentor gives young people someone to talk to, build a relationship with and bounce ideas off. Its something i never had as a young person and would definitely have benefited from. Heya, I’m Emma, I am the Mentoring Coordinator. A part of my job is meeting with the mentee’s, to ensure that they receive support specially targeted for them. I love to watch (probably too much) Netflix, i love reading and collecting graphic novels, cooking and eating (definitely too much food) and Football.I think Mentoring, and Youth Work is so important for just letting young people know they are valued, they are heard, and having the support they need for them to see what we know they are capable of achieving. It is an amazing opportunity for all involved! focus is to ensure that our programme whole-heartedly meets the individual needs of every young person involved, alongside ensuring that our dedicated mentors, who volunteer their personal time, are given opportunities to continuously develop. I am incredibly passionate about psychology, being creative and seeing people succeed, which is why it is such a privilege to see our programme making a difference to so many lives. Hi, I’m Mitch, one of the Mentoring Youth Workers and volunteer mentors! I love being part of such a fantastic programme supporting both mentee’s and mentors to reach their full potential. My hobbies include gaming, watching marvel films and combat sports. I love being a mentor because it gives me a chance to be the supportive figure i needed when i was young and i feel privileged to have the opportunity to do exactly that! Hey, I’m Billie, Mentoring Lead for The Ways Youth Zones’ Mentoring Programme. privilege to see our programme making a difference to so many lives.